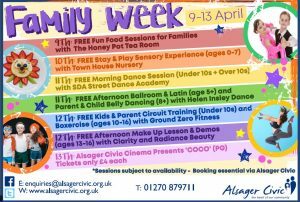 An exciting week of events to keep the children entertained over the Easter Holiday break! To include workshops and events run by local businesses and organisations to kick boredom into touch. We are busy planning an exciting programme of events for this week, to include great organisations that operate locally and we are lucky to have at our disposal. On Monday 9th April The Honey Pot Tea Room are offering a fun food session for children and accompanying adults. This session will be an opportunity to get stuck in and make a healthy lunch snack together and an Easter related cake! There will then be hot chocolate and juice provided as well. This is a free session, and all ages welcome but booking is essential!! Please call for more information. On Tuesday 10th April Townhouse Nurseries Alsager are offering a stay and play sensory experience for Children ages 0-7. Townhouse nursery always deliver a fantastic workshop and session for our family week and are back by popular demand! This session is free, but booking is essential. On Wednesday 11th April SDA Street Dance Academy are storming our main hall with 2 taster sessions of the classes they offer in Alsager on a Thursday evening. They wowed us on the main stage at the Christmas light switch on in November and were sensational. They will be offering 2 different dance taster sessions. 10am-11am for under 10’s and 11am-12pm for over 10’s come a long to see what they are all about and have some fun! On Thursday 12th April Ground Zero Fitness are offering 2 fun taster fitness classes. Kids and parents circuit fro under 10’s and boxercise for ages 10-16. Then on Thursday afternoon Clarity & Radiance Beauty are providing a make-up master class with lessons and demonstrations fro 13-16 year olds. Booking is essential for all sessions above. All sessions, excluding the Civic cinema are FREE and places are given on a first come first served basis, subject to availability.